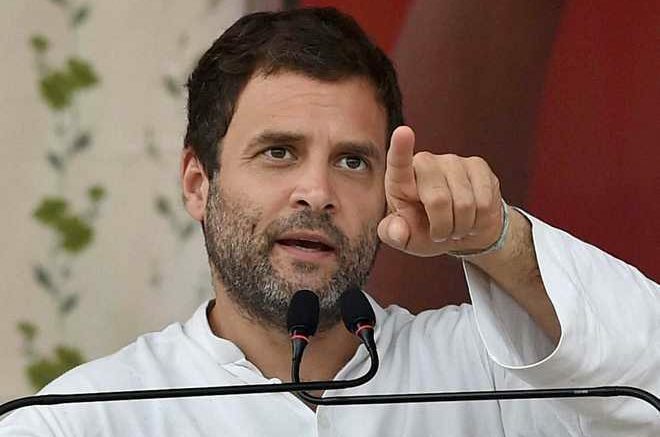 Congress President Rahul Gandhi on Thursday called Prime Minister Narendra Modi a coward for not debating him on the Rafale deal. The Congress chief then challenged the prime minister to a debate on national security and other matters. On January 2, Gandhi had challenged the prime minister to a 20-minute debate on the subject. The Congress has accused the Centre of signing an overpriced deal and helping Anil Ambani’s Reliance Defence Ltd, which had no prior experience in the sector before landing a contract with Dassault Aviation that manufactures the fighter jets. The Opposition leader accused Modi of dividing the nation and neglecting minority communities. He claimed that the Congress would defeat the Bharatiya Janata Party and not allow the country to be run from Nagpur, the headquarters of the Rashtriya Swayamsevak Sangh. The RSS is the ideological parent of the BJP. The Congress chief claimed that Modi had visited Beijing and conducted a dialogue with the Chinese government without any agenda. “The Chinese government realised Mr. 56 inch is not even four inches,” Gandhi said. “This is Mr Modi’s character, he bowed down to China on the Doklam issue.” He was referring to the standoff between India and China in the Doklam region in 2017. In his speech on Thursday, Gandhi also cited the press conference held by four Supreme Court judges last year at which questions were raised about how the top court was being run. The Congress leader claimed that this was an example of the way the Centre was interfering in government agencies. “The country is going to show the BJP that they are above not the party and not the other way around,” Gandhi added. Be the first to comment on "Rahul Gandhi calls Narendra Modi a coward, challenges him to a debate on Rafale deal"